Yep, almost 10 hours in coach (westbound) without a meal is pretty savage. I'd also like to see the business case for a layflat configuration in F. My guess is that a decent number of tickets (both F and Y) are consolidator tickets sold through cruise operators and it would be difficult to increase prices on those tickets. On the other hand, I think the load factors for those flights are very high, which signals an opportunity to shift up fares. DL.com shows it at 7-7.5 hours not 10....7 is a long time don't get me wrong, but summer is also the peak demand time for lie-flats equipped planes. Especially since it's a daytime flight the usefulness of the lie-flat would be limited. Great Circle Map shows ATL/ANC at 3,417 and JFK/LHR to be 3,451. And I agree that it very doubtful DL could get the same yields in J for a D1 equipped plane ATL/ANC as it could for most ATL/TATL flights. I think this is an unreasonable position. In case of an emergency requiring evacuation, a parent whose child is 7 rows behind him, is not going to leave the airplane in an orderly fashion. He's going to get his kid and you don't want to be in his way when he's heading upstream. It's a serious safety issue and it should be a regulatory requirement that children under 12 be seated adjacent to a parent. I agree with this, actually. Mostly because I don't really want to be the de facto adult seated next to their 4 yr old. 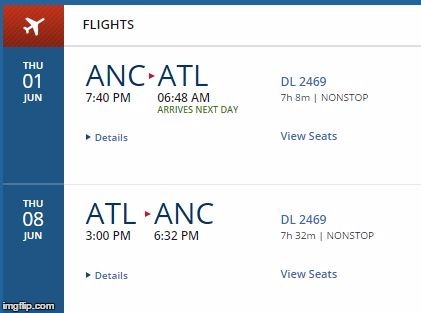 My wife and I have been booked on a flight from ATL to MKE since June. The aircraft has been changed at least 3 times. The last time was in Dec. The aircraft is a 737. Seats have been moved by Delta several times but we were always seated together. The last time even though we are still on a 737-900 the put us in seats A and C with someone in B. Will we be out of line asking the person in B if he would rather have A or C so that we may be seated together? Oh and by the way the original aircraft was a 737-900 and we prebooked A and B. I can understand if a plane is changed your seats can be changed but if it stays the same why does Delta in their infinite wisdom randomly move people around? I'd say this is the best way to go when traveling as a couple - book the window and aisle in hopes you get the row to yourself, since an open middle seat is less likely to be booked than a window or aisle. If it is taken, offer the trade, but make it sound like you're doing them a favor - e.g., "Would you prefer..." vs. "Mind trading so we can sit together?" I agree, it's a safety issue, which is why it is an issue between the parent and the airline, and not the parent and me. I'm not swapping to a less desirable seat because someone wants to engage in discretionary travel with their child. Not MY problem. The key word is westbound my friend. It's 7.5 going East and nearly 10 going West due to the jet stream. In comparison, JFK-LHR is 7h on the eastbound and 8h on the westbound. That's significant shorter compared to ATL-ANC, especially on the westbound. I doubt DL has it blocked 2.5 hours short of the time it will take. Oh wow, that's embarrassing... I was accidentally looking at the 1 stop thru MSP. It has taken nearly 10 hours for me before, but that was an abberance with very strong headwinds. The same of course can happen with flights across the pond. I think I was the subject of an attempted seat poach last week. Flight from ATL to SAV on a CRJ700. I had 3A which, as we all know, is the last seat in F on that aircraft. I boarded towards the end of PREM but before SKY had been called. I get on the plane to find a guy sitting in my seat with bag stowed and trying to go into full cocoon of Bose headphones and sunglasses. I tapped his arm to let him know that 3A was mine, and I'm pretty sure he pretended not to hear/notice me. Tapped him again. This time he responded to my letting him know that I had 3A with a comment that he, in fact, had 3A, it was on his BP he had just checked. I showed him my phone with 3A on it, and he sort of grumbled something. After rummaging around in his pocket for a minute, he pulls out a crumpled 4A pass --- a C+ seat! He sulked back to coach. Now, I'd like to give this guy the benefit of the doubt, but he boarded with PREM when he clearly didn't have a F seat -- meaning he "should" be a DM. And if he's not a DM, then he's already playing games. Some may say that he thought this flight was on a CR9 and that 4A is the last row of F on that plane, so that's what he did -- just took the last F seat. I don't buy it. If you fly enough to be DM and are astute enough to "know" that your seat number should correspond to the last seat in F, you should know that you only counted to 3 when walking down the aisle. Plus, he actually stated that 3A was his. Methinks this was deliberate. Another attempted poacher banished! Had a random non-bulkhead F window seat last week that was found occupied upon my boarding by a gentleman whom was quite settled in. He asked if I'd switch to his window so his wife could sit next to him. Slightly annoying he'd assumed I'd switch, but not really a big deal and I took his seat. I had a nice flight from SNA to DTW. Got on my DTW-BOS flight and encountered the same scenario - with the same exact couple! We shared a laugh and moved on with our lives. The parent could always put the child in the "forward" seat of the pair, no? [Assuming that "the nearest emergency exit may be behind you" doesn't apply.] That said, if I'm seated next to a small child and it's a real emergency evac, I'm grabbing the child on my way out and, if possible, signalling the parent. That said, if asked politely and offered a similar seat (e.g. non-bulkhead aisle in same class of service as I will have (universally) booked) then I am much more inclined to go along with it than if I (a) find a poacher seated in my seat (yet another reason to pre-board) or (b) someone 'makes demands'. The last time I agreed was on 'Flot to accommodate a couple and I was offered aisle for aisle, and wound up sitting next to a guy I had a great convo with. The last time I refused was when the alternate seat (still aisle for aisle) was next to a person who had been a total [crap] show in the boarding area, and during boarding, and probably in all other aspects of her life. And I mean there was lots of DRAMA. I declined and basically said, "I'm not sitting next to that horror show" at which point the guy resigned himself to his fate. Granted, this was on AA, but I had booked 2 FC seats and at the last minute, AA cancelled the flight (crew didn't have enough sleep time or something), so we were rebooked on a diff. flight (no FC on the first segment, boo!, but that's AA for you), on the 2nd segment, we were lucky to get the last 2 FC seats, but they were not together. Do you have this window seat? If so, my wife has that aisle seat over there, would you mind switching so we could sit together? This must be fate. I would love to sit in that aisle seat. Needless to say, everyone was very happy and we had a good time and he was very thankful (so was I) that everyone was polite about it. Is asking really imposing, though? A simple "no thanks" takes care of it. It seems there are two main issues discussed ITT. One is the obvious one -- the demanding/poaching requester. The other, though, seems to be when the person being asked politely is uncomfortable declining. Saying 'no' and not feeling bad about it is an important life skill. If there's one good takeaway from this thread for everyone, hopefully it is comfort in declining. Sure but very few people ask politely and accept no for an answer. Another strategy is to try to get a FA to pressure the person to move.